The victory by the Diocese may prove to be another Pyrrhic one for the Episcopal Church (USA), which has spent around a million dollars litigating the case. It is unclear whether the remnant and their priest-in-charge will have adequate resources to maintain the buildings and all the related expenses of a full parish. And it is also not clear at this writing whether the case is finally over: the defendants have 90 days within which to ask the United States Supreme Court to review the decision, as I will explain below. There are actually two opinions today by the Connecticut Supreme Court; I have linked thus far only to the main one. The second decision affirms the trial court's rejection of a motion by the full former congregation of Bishop Seabury's, with some 280 voting members out of a total of about 700, to be allowed to intervene in the case to defend their title to the property. The Supreme Court decided that the interests of the larger group were adequately represented in the principal litigation by the twelve individual defendants. Having considered these differences, we conclude that the neutral principles of law approach is preferable because it provides the parties with a more level playing field, and the outcome in any given case is not preordained in favor of the general church, as happens in practice under the hierarchical approach. Jones thus not only gave general churches explicit permission to create an express trust in favor of the local church but stated that civil courts would be bound by such a provision, as long as the provision was enacted before the dispute occurred. We also reject the view that the Dennis Canon represents a ‘‘self-serving declaration of trust’’ because, as we previously noted, Parish members agreed to be bound by the constitutions and canons of the Episcopal Church and the Diocese in 1956 when they affiliated with the Episcopal Church, and, as a result, their interests are in harmony with those of the Episcopal Church and the Diocese. Thus Connecticut now joins California and New York as States of safe haven for ECUSA's ambitions to have all parish property everywhere under its thumb. As readers of this blog will be aware, the highest courts of the latter two States have each professed to follow "neutral principles of law" on the surface, while in reality deferring to the so-called "hierarchy" of the Episcopal Church (USA) underneath. The result is to grant to ECUSA a favored status under State law, because the decisions mean that only nationally structured churches such as ECUSA and PCUSA can qualify for special treatment. Connecticut now joins those two other States in that approach. While normal people in all three States have to comply with the Statute of Frauds in order to create a trust in real property, these special churches do not. Under the Statute of Frauds as recognized in all fifty States, a trust in real property can be legally created only by a writing signed by the actual owner of the property. But for the special churches mentioned earlier, all they have to do to create trusts in the properties of all their individual parishes is to enact a national rule, or canon -- and for ECUSA, that is its Dennis Canon. Selecting out some churches for preferential treatment under State law harkens back to the colonial days, when every citizen was taxed to support local parishes of the established Church of England, regardless of whether they happened to belong to those parishes or not. This was one of the reasons for the enactment of the First Amendment as part of the Bill of Rights: it expressly prohibited Congress from "establishing" any religion -- which would include favoring one or more over any others. Later on, in subsequent decisions, the United States Supreme Court extended the reach of the First Amendment to all of the fifty States, as well. When the Dennis Canon [of 1979] is considered together with the application submitted by the members of the local congregation in 1956 for admission to the general church as a parish and with other church documents, it is clear that the disputed property in the present case is held in trust for the Episcopal Church and the Diocese. . . . Thus, in agreeing in 1956 to abide by the constitution and canons of the Diocese, members of the congregation also agreed to abide by the constitution and canons of the Episcopal Church, including the subsequently enacted Dennis Canon. There is no provision in the constitution and canons of the Episcopal Church or the Diocese expressing an intent to the contrary or excusing a parish, either explicitly or implicitly, from complying with amendments or additions to the constitution and canons that might be enacted after a parish is accepted by the Diocese. And it is this discrepancy in treatment which may give Bishop Seabury's a federal ground on which to ask the United States Supreme Court to review today's decision. This is especially true in light of the earlier decision by South Carolina's Supreme Court, which also under "neutral principles of law" refused to give any legal effect to the self-declaratory Dennis Canon. It is difficult to see how "neutral principles of law" can be used to arrive at exactly opposite results, unless the result in favor of the national church is due to the granting to it, under State law as interpreted by that State's highest court, a special preference which would be unconstitutional under the First Amendment. Cut it any way you like, but today's decision contributes further to the patchwork quilt of church property jurisprudence, in which all courts applying the same "neutral principles" still reach different results: the Dennis Canon ostensibly binds parishes in New York, Connecticut and California, but not in South Carolina, Kentucky, New Hampshire or Arkansas -- with Virginia still to be determined. And for that crazy result, we have ECUSA and its hired attorneys to thank. So -- hang on to your hats. This case is not over until it is over, which is to say, until we see whether a petition will be filed in the next ninety days. The Supreme Court of Connecticut today decided in favor of the Episcopal Church and the Episcopal Diocese of Connecticut in a dispute arising when a number of former Episcopalians claimed ownership of the building and property of the parish they had attended. . . .
"We now conclude under neutral principles of law that the Dennis Canon applies and that it clearly establishes an express trust interest in the property in favor of the Episcopal Church and the Diocese," [Connecticut Supreme Court Justice] Zarella wrote." The article goes on to list all the instances where State supreme courts and other courts have ruled in favor of the Episcopal Church and the argument that the Dennis Canon means that all property in the Episcopal Church is held in trust for the Episcopal Church as a whole. For your information, Dean Knisely, the article does not provide anything even approaching such a "list." In the first place, it confines itself just to a listing of cases in 2011, so it does not claim to survey the entire field. Next, it mentions the California litigation involving St. James, in Newport Beach, California -- in which St. James won its right to go back to the trial court for further proceedings: that is hardly an instance where the State court ruled in ECUSA's favor. Then the article mentions Pittsburgh, but that litigation is waiting to hear whether the Pennsylvania Supreme Court will review the appellate court's decision. And look at the other cases it mentions: Virginia and Texas, where there are no final rulings of any kind, and --- wait for drum roll, please -- Canada! What if the Foundations Were not Designed for the Current Structure? [Nota Bene: Readers are warned in advance that this will be the first in another of those desultory series on this blog about the continuing decline and fall of ECUSA. It is an elaboration of my far briefer remarks for this week's Anglican Unscripted, which the less interested reader could simply watch instead. More parts will shortly follow. In 2008, the political mood of the country was significantly behind the "Hope and Change" platform of the first black President of the United States. Nearly three years later, however, there are serious recriminations being voiced about whether the structure the President has built around that platform is in the country's best interest, and whether the Obama administration deserves another four-year term to keep enlarging it. The problem is that Obama has been trying to fit a statist structure, or polity -- one where decisions at all levels are made by the government, and specifically, by the executive branch -- onto foundations that were designed from the outset to support divided government, with its various checks and balances. The result has been a budgetary and political catastrophe. Billions and billions of dollars have been allocated to bailing out companies which deserved the failure their own shortsighted policies had brought upon them, but who survived instead to fail another day, thanks to their cronies in the government being generous with the taxpayers' money and with the credit of future generations. Czars by the dozen have interfered in every aspect of citizens' lives, without any authority conferred upon them by Congress (even assuming arguendo that the Tenth Amendment did not reserve all such authority to the people themselves). Unemployment remains stagnated at an unacceptable level, simply because the business climate has been rendered so uncertain by Obama's statist interventions into the economy. Those misguided measures produced unworkable distortions which are discouraging entrepreneurship and new investment (think: the moratorium on drilling in the Gulf of Mexico, or on the opening of new shale deposits, with the resulting continued record high costs of fuel -- and look at what is happening right now to the Canada pipeline project). In 1810, it would have been impossible for Congress to conceive of telling Americans that they had to switch from burning tallow candles in their homes to ones made only of beeswax, in order to reduce smoke and cut the waste of wax drippings. But just 200 years later, Congress felt free to dictate to all Americans what kind of lightbulbs they could use, in order to conserve electricity. How is this possible? Then it continued with expansion of the national Church's budget, almost 40% of which is now fed by monies from the federal government (for Episcopal Migration Ministries), in order to accommodate the multiplication of Committees, Commissions, Agencies and Boards (over 75 now discernible), and the huge growth in the House of Bishops, with now over three hundred members (that's more than three for every diocese!) -- two-thirds of them, of course, having resigned (retired from) their jurisdictions. We are now at a point where the Episcopal Church (USA) finds itself in significant structural trouble, which is having equally significant ramifications for its budget. As we have just seen, all during the period that it was steadily dropping in membership, the Church was expanding its national superstructure and its budget. This made no sense, but apparently no one in charge cared, until the steady decline in voluntary contributions, from an ever-shrinking base of parishioners, literally forced the leadership to make painful cuts. And still, the Church continues to lose members -- on average, about forty parishes a year (the equivalent, one of its officers says, of a "very small, admittedly, diocese"). Even such a small number, however, adds up significantly over time, and the cumulative effects are extremely unhealthy for future prospects. ECUSA is like a huge mansion constructed some time ago, whose foundations are slowly eroding while its superstructure remains just as huge and heavy as ever. It makes no sense for the House of Bishops to keep growing while the number of parishes steadily diminishes. Likewise, it makes no sense for ECUSA to be downsizing its budget, to match the fall in voluntary contributions, while sending its bishops to meet in Quito so that the Church can demonstrate its claim to an "international" polity. These two observations, however, furnish a basis for drawing further conclusions about what is now happening. A third observation coincides with the second one: one wholly unstated purpose of the bishops' traveling to Ecuador for their meeting was so that the Bandit Bishop could raid another diocese, and force out those she now found unsatisfactory in order to put in administrators of her choosing (and start a new round of the debacle that began with the arrogance of General Convention in 2009). One would like to have been a fly on the wall when Bishop Jefferts Schori informed Bishop Luis Fernando Ruiz that she expected him to resign by the end of the month, "for the good of the diocese." Did she have her Chancellor present, and did he suggest that a refusal might offer the inaugural occasion for her to exercise the new metropolitical powers which she was given [albeit illegally] under the revised disciplinary canons? ECUSA from its beginnings was never designed with the foundations to accommodate a huge mansion. Its base was more akin to a small but sturdy platform designed to hold a collapsible tent, which it erected once every three years for a brief period. Select numbers of the Church's clergy and laity would come and meet in the tent, and then fold it up and put it away for another three years. Its presiding bishop was just another diocesan, like everyone else, who had his own diocese to run in the interim. Chairing a tent meeting every three years was not a significant additional burden for one bishop to assume, and that was how the Church functioned at the national level for 160 years. ECUSA's General Convention in those days had as its primary function the hearing of reports on the status of the Church in each Diocese. Occasionally it was called on to admit another new diocese into union with the Church, or appoint a bishop to supervise a missionary diocese, and now and then it adopted amendments to the Canons. But its role on the national scene was largely ephemeral, and entirely forgettable. What changed ECUSA structurally from its original model was the slow but steady growth in the size of its House of Bishops, as more and more territory came under ECUSA's jurisdiction, and also the advent of powerful new social forces. The first factor forced a change in the office and functions of the Presiding Bishop; following that change, the second factor transformed the character of the Church itself, under the active leadership of the new breed of Presiding Bishops. In the fifties and sixties of the twentieth century, the Church's identification with the "peace and justice" movement began to add to its superstructure. At first, the Church became fired up with zeal for the civil rights movement in the South. To demonstrate its solidarity with the cause, its Presiding Bishop, the Rt. Rev. Henry Knox Sherrill (founder of the World Council of Churches), even canceled a General Convention which had been planned for still-segregated Houston, in 1955, rather than be embarrassed in front of his colleagues on the Council. Under his successor's initiative, the Church embarked on the "General Convention Special Program", by which money raised in dioceses, largely by Episcopal Church women through their United Thank Offering, was given to Presiding Bishop John Hines to use for his own social and civil rights agenda in the South and elsewhere. It was an ambitious program which soon began to undercut those of the several dioceses, and which, of course required an ever-larger bureaucracy -- and eventually, in 1963, a brand-new skyscraper for their headquarters. But notice, if you will, the opposing direction of these two trends. The steady enlargement of the House of Bishops meant that they became a force of their own -- to be reckoned with, but primarily concerned with their own unique powers and theological innovations. Heresy entered the House of Bishops, first with Bishop Pike, and then with Bishops Spong, Righter and others quickly following through the breach which Bishop Pike had made. At first, the assembled bishops managed to censure Bishop Pike, but after that their courage became too diluted, and they failed to discipline the new generation of heretics. Eventually, as we all know, heresy swallowed up orthodoxy, and became itself the new orthodoxy under the new breed of bishops. While the Bishops were distancing themselves from the traditional positions of those in the pews, at the same time the second trend, the new activism in the name of "peace and justice", was slowly transforming General Convention itself, and its House of Deputies. Convention is more than legislation. One of the most interesting parts of convention is the Exhibit Hall. The Exhibit Hall reminds me of an oriental souk: it is a marketplace of goods and ideas in which the organizations and interest groups within the church present their wares, recruit members and do their best to influence legislation. It is a colorful part of convention, and it would not be General Convention without it. Many church-related organizations hold meetings in conjunction with convention, and there are lunches and dinners hosted by seminaries, provinces, societies, boards and staff offices of the church. . . .
General Convention is a combination of legislative assembly, bazaar of goods and services and family reunion. It is one of the most exciting and, truth be told, one of the most awe-inspiring gatherings in the world. Deputies are not delegates; that is, they are not elected to represent the electing dioceses. Deputies vote their conscience for the good of the church. They cannot be instructed to vote one way or another, for to do so would preclude godly debate and preempt the work of the Holy Spirit. . . .
Is it any wonder, then, that there is an ever-widening disconnect between what goes on at General Convention and what goes on in the daily life of the Church? The former has become nothing more than a spectacle, a useless extravaganza costing the Church millions, which enables its select participants to feel good about themselves. Once General Convention adjourns after coming together for ten days, its same members never get together again, so there is little follow-up on the myriad resolutions which it enacted, and zero accountability for what was done in the Church's name (such as amending the disciplinary canons to give the Presiding Bishop metropolitical powers). As I hope you now can see, this mismatch between structure and design is the same problem which President Obama ran into when he tried out his statist platform on our traditional government base: it didn't fit, because the foundations were not designed to support such a structure above. Likewise, the model for the national Church, with its simple platform for a collapsible tent brought out only once every three years, cannot support an ongoing national bureaucracy, whose agenda is frequently at odds with the agendas of the member dioceses. The disintermediation is undermining the Church's structure, as well as its budget, and cannot long continue without further and far more radical changes than those which have occurred up until now. In the next post in this series, I will take up the recent proposal from Bishop Stacy Sauls, the Church's new Chief Operating Officer, for just such a "restructuring." Two years ago, the parishioners of St. Mark's-on-the-Mesa in Albuquerque left the Diocese of Rio Grande to found the Anglican Church of Christ the King. In doing so, they left everything behind them, including real property, furnishings and endowments worth over $ 2 million. I pray that this finds you well in the Lord! Summer is always such a gift in the ministry, a time for reflection, refreshment and anticipation for the end of the liturgical year. On July 12 of this year, the Diocesan Council had a meeting here a [sic] Diocesan House. At that time, a group from St. Mark's-on-the-Mesa, Albuquerque came before the Council to request forgiveness for their Fair Share obligation from the third quarter of 2009. As I am sure you are well aware, it was during this time that a good number of the clergy and congregation at St. Mark's-on-the-Mesa left to form a new congregation, leaving the remaining members with quite a financial and emotional burden to carry. What follows is the motion as it was amended and passed that afternoon. Motion, that the -$25,000 Fair Share obligation for St. Mark's on-the-Mesa, Albuquerque for the third quarter of 2009 be forgiven. Moved and seconded to amend the motion by replacing it with the following: that the -$25,000 Fair Share obligation for St. Mark's-on-the-Mesa, Albuquerque for the third quarter of 2009 be adjusted to $5,000 and that the Diocesan Council write a pastoral letter to the leadership of Christ the King Anglican Church appealing to them to cover $20,000 of the original Fair Share obligation for St. Mark's on-the-Mesa, Albuquerque for the third quarter of 2009. The amendment passed. The amended motion passed. As you can see, it was the decision of Council to hold St. Mark's-on-the-Mesa responsible for the entire Fair Share payment for the third quarter in 2009, requesting that the burden be split between the members that left and the members that stayed, dividing the responsibility roughly along the lines of how the congregation self-selected. I would ask that you would prayerfully consider accepting the responsibility of paying the portion of the Fair Share that was required by the Episcopal Diocese of the Rio Grande. If you have any questions regarding this matter, please contact me here at Diocesan House, or in my absence, Mr. Fred Winter or Ms. Lisa Katz-Ricker, 505-881-0636. How nice it was to hear from you after such a long time! With you, my congregation and I are enjoying the waning days of summer -- "a time for reflection, refreshment and anticipation for the end of the liturgical year", as you say. And I have to confess, your letter of August 31 does find us "well in the Lord." Now that we no longer have to tolerate Biblical revisionism and heresy at the highest levels of our church, we are experiencing Christ's blessings upon us more richly than ever before. Be it resolved that since this congregation has given far more to the Diocese than it has received, it is more than abundantly blessed, and does not consider that it needs still more blessings through additional works of charity for the Diocese. The vestry has asked me to convey to you and your Diocesan Council its sincere thanks for the opportunity for additional blessings which it so thoughtfully bestowed upon us, and its deep regret that, as our cup now overfloweth, we could not avail ourselves of your generous offer. Sometimes the only response to an adversary's overweening chutzpah is to meet it with warmth and complete charity, "for so you will heap coals of fire on his head, and the Lord will reward you." The Constitutional issues splitting the Episcopal Church are at last coming to a head, so there is at least that much for which, as an Episcopalian, to be thankful. But the tone and tenor of the confrontation do not bode well for the future of the Church. As readers of this blog already know, it is an undeniable fact that the only members of the unincorporated association which currently calls itself "the Episcopal Church in the United States of America" are its dioceses. Moreover, history provides incontrovertible evidence that the Diocese of South Carolina was a legal entity whose existence preceded that of (P)ECUSA by at least eight years or more. The autonomous Diocese of South Carolina (as it then indisputably was) helped to form the association that is (P)ECUSA in 1789. It did not thereby, somehow in the act of formation, disappear or dissolve into the maw of some larger entity -- as subsequent history showed when, during the Civil War, the Diocese of South Carolina withdrew from PECUSA and joined the Protestant Episcopal Church of the Confederate States of America. This is such a crucial preface to what follows that I shall restate it: only dioceses, in their given territories, are legal members of the association which is the Episcopal Church (USA). As such, they are free, under the First Amendment, to join it or to leave it at their pleasure, through duly enacted amendments to their governing documents -- which ECUSA is, again under the Constitution's First Amendment, powerless to annul or forbid. Oh, really? And just who, pray tell, is this supra-diocesan "Executive Council", or its "Joint Standing Committee on Governance and Administration"? Answer: the Executive Council is not an official body of the Episcopal Church (USA), because it is neither a constituent member of that association (only dioceses are members), nor is it a creature of ECUSA's Constitution, which does not mention it in any of its Articles. And by definition, a committee created by the Executive Council to operate under its auspices, whether sanctioned by canon or not, can attain no supra-diocesan status, either. Instead, the Executive Council is nothing more than a glorified Board of Directors, to whom additional express duties have been delegated (and those duties emphatically do not include ruling on the constitutionality vel non of amendments by dioceses to their governing documents). The entity of which it is the Board of Directors is not the unincorporated association which is the Episcopal Church (which has no Board), but instead is the New York charitable corporation which calls itself "the Domestic and Foreign Missionary Society." That Corporation's articles were established by Canon, and the role of the Executive Council as its Board was likewise established by Canon. But I repeat: no mere canon of the Church can elevate the Board of Directors of a separate religious corporation, let alone one of its joint committees, into a supra-diocesan authority within the association of dioceses that form the Episcopal Church (USA). Let me give you an ordinary-day analogy: the claim by the Executive Council to be able, by one of its resolutions, to "nullify" a duly adopted amendment by a diocese to its own Constitution and Canons is akin to the Board of the Book-of-the-Month Club claiming the power to nullify your neighborhood book club's bylaws, just because all of your book club's members were also subscribers to the Book-of-the-Month Club. They would never claim any such legal authority, and it is just as preposterous for the Executive Council of the DFMS to claim such authority with regard to members of ECUSA. There is a reason, after all, why an unincorporated association like ECUSA has a Constitution. It embodies the terms of the contract between and among its several member dioceses. All of those members are signatories to the contract, and no non-member has any ability to sign or otherwise modify the terms of that contract. That corporation so formed by canon of General Convention needed a board of directors under New York State law. Initially, the Canon authorizing the Corporation provided that the Board consisted of 24 members elected at each meeting of the DFMS, while all of the Church's bishops were deemed "Vice Presidents" of the Corporation. Those provisions, however, became unwieldy with the passage of time, and various intermediate solutions were adopted, only to be abandoned at subsequent Conventions and replaced by still other substitutes. Sec. 2. The Presiding Bishop and Council shall exercise all the powers of The Domestic and Foreign Missionary Society . . . and have charge of the unification, development, and prosecution of the work of Missions, Church Extension, Religious Education, and Christian Social Service; of the performance of such work as may be committed to them by the General Convention, and of the initiation and development of such new work between the sessions of General Convention as they may deem necessary, subject, however, to the provisions of the Constitution and Canons . . . .
Sec. 1 (a) There shall be an Executive Council of the General Convention (which Council shall generally be called simply the Executive Council) whose duty it shall be to carry out the program and policies adopted by the General Convention. The Executive Council shall have charge of the coordination, development, and implementation of the ministry and mission of the Church. (b) The Executive Council shall be accountable to the General Convention and shall render a full published report concerning the work with which it is charged to each meeting of the said Convention. The report shall also include information on the implementation of all concurred resolutions of the previous General Convention calling for action by the Executive Council, by its officers and staff, and by the jurisdictions of the Church. (e) The Council shall exercise the powers conferred upon it by Canon, and such further powers as may be designated by the General Convention, and between sessions of the General Convention may initiate and develop such new work as it may deem necessary. It may, subject to the provision of this Canon, enact By-laws for its own government and the government of its several departments. (f) In its capacity as the Board of Directors of The Domestic and Foreign Missionary Society, the Council shall have the power to direct the disposition of the moneys and other property of said Society in accordance with the provisions of this Canon and the orders and budgets adopted or approved by the General Convention. Needless to say, any powers conferred on the Council by Canon cannot override the powers of the several Dioceses under the Constitution. Although liberals like to argue otherwise, based on no verbal or historical evidence whatsoever, the documented history of the Church and its General Convention establishes conclusively that its member Dioceses are sovereign and autonomous, except only as they have severally agreed to be bound by the provisions of the Constitution. Liberals like to argue, for example, that to "accede unconditionally" to the Constitution and Canons of ECUSA, as a Diocese sometimes (but by no means always) does on coming into union with ECUSA, binds the Diocese perpetually to be a member of the association which is the Church. Such an argument reads far too much into that language, however, because such a reading would assert that the Episcopal Church is above (or somehow exempt from) the restrictions of the First Amendment. Under the language of that Amendment, as construed by the Supreme Court, the Constitutional guarantee of "freedom of association" includes both the right freely to join (religious and other) organizations and associations, as well as the right to leave them. In short, even were there a written clause in ECUSA's Constitution forbidding members from withdrawing once they have joined -- and I emphasize that there is no such clause -- it would be unconstitutional, and unenforceable in any court of the United States. The recent actions of the Executive Council are thus delusional, and on a grand scale. They arrogate to the Council a power which it never has had, and never could have. The fact that the Council believes it could exercise such legal power shows what terrible legal advice it is currently receiving -- legal advice which must be wholly colored by the plain need of the Presiding Bishop's Chancellor and his law firm to maintain the fiction that all member dioceses are subordinate to some ethereal, non-existent entity which is "the Episcopal Church." The obvious appeal is to the analogy of the United States -- which, unlike ECUSA, has an executive branch and a judicial branch which are co-equal with its legislative branch, and the three branches thus form a single, unitary political entity in the eyes of the law. But at the head of ECUSA, there is no such unitary entity. There is only an occasional legislature, which meets once for ten days every three years and then dissolves, never to assemble in the same form, and with the same legislators, ever again. There is no supreme ECUSA judiciary, empowered authoritatively to construe and interpret the Constitution and Canons -- witness this very current dispute: there is no "court" within ECUSA that can authoritatively pronounce just what are the delegated powers of the Executive Council, and have that pronouncement deemed "binding" on the whole Church. Likewise, there is no (at least not yet) President of the Episcopal Church, with the power to sue and be sued on behalf of the Church, to sign binding contracts on its behalf, and otherwise to enforce its laws (canons) in every Diocese. All persons within this Church shall celebrate and keep the Lord's Day, commonly called Sunday, by regular participation in the public worship of the Church, by hearing the Word of God read and taught, and by other acts of devotion and works of charity, using all godly and sober conversation. In short: this latest action by the Executive Council is itself a nullity, because it is not authorized by any provision in ECUSA's Constitution. Those who make their rules must live by their rules, but ECUSA's Presiding Bishop, her Chancellor, and its Executive Council are deluded otherwise, because the House of Bishops and the House of Deputies have let them get away with it -- for too long! If, therefore, this is ECUSA's equivalent of the opening salvo on Fort Sumter, then prepare for civil war. As readers of this blog are aware, your Curmudgeon is no fan of the Dennis Canon, which I like to call the Episcopal Church (USA)'s Trojan Horse. It has spawned a disproportionate amount of Church property litigation, because it operates by stealth, and springs onto the back of a parish just at the time when it is most vulnerable, having decided to take the final step to disaffiliate from ECUSA. All of a sudden, the Bishop of the Diocese swoops down with his attorneys, and orders the congregation to vacate its building, and leave everything behind, from the altar candlesticks to the bank accounts and pew cushions. "Because you no longer are operating within the Episcopal Church," he says, "Canon I.7.4 [the Dennis Canon] declares that all of your property is now forfeit to the Diocese, since it was always held in trust for this Diocese and the Church." Such a claimed operation for the Canon comes as a surprise to many congregations who thought that their years of paying for the acquisition, construction and maintenance of their building, plus a deed in their name, meant that they owned it. Furthermore, every State in the United States has a law which says that trusts in real property can be created only by a writing signed by the owner of the property. The Dennis Canon operates in reverse: it purports to create a trust in church property without the owner's signature, and just on the authority of ECUSA's General Convention. As I noted elsewhere, it purports to operate as though, upon you and your spouse's joining the Democratic Party, your house and all your worldly goods become forfeit to the Party should you ever decide to become a Republican. States such as California and New York are lost causes, however. Although they have the same statute regarding how trusts are created as does every other State, they also have statutes which create special exceptions to that rule for national churches like ECUSA. The exception allows such national churches to create trusts in parish properties unilaterally, without the individual parishes' consent, by providing for such trusts in their governing documents. The highest courts in California and New York have accordingly upheld the validity of Dennis Canon trusts against individual parishes who decided to leave the Episcopal Church (USA). To date, the only State to rebuff clearly and unequivocally the idea of a Dennis Canon "trust" in church property has been South Carolina. In cases decided by their Supreme Courts, the States of Kentucky and New Hampshire have also indicated that they might not ratify the creation of a trust by a trust beneficiary, as opposed to by the property's actual owner, since they have declared that they would apply a strict "neutral principles" approach. For example, in Berthiaume v. McCormack, 153 N.H. 239, 891 A.2d 539 (2006), the New Hampshire Supreme Court wrote that a court must “consider only secular documents such as trusts, deeds, and statutes. Only if these documents leave it unclear which party should prevail will we consider religious documents, such as church constitutions and by-laws, even when such documents contain provisions governing the use or disposal of church property.” (Id. at 248.) It justified this ranking by holding that such an approach “is consistent with [the] rules governing the resolution of property disputes generally. In resolving such disputes, [courts] consider extrinsic evidence and the circumstances surrounding a conveyance to determine the parties’ intent only if the language of the relevant documents contains either patent or latent ambiguity.” (Ibid. [citations omitted].) The Court went on to decide that as title to the property in question was held solely by the Roman Catholic Bishop of Manchester, he could sell it to another denomination without having to keep it in trust for Catholic parishioners. The Presbyterian Church (USA) has also been taking a number of property disputes to court, with mixed results. It has a provision in its governing Book of Order which tries to accomplish the same goal as the Dennis Canon -- to ensure that all congregational property is held in trust for the larger presbytery of which the congregation is a part. Moreover we agree with both Carrollton and the district court that, even if we were not persuaded that Carrollton is exempt from the Book of Order's express trust provision, Louisiana trust law would apply to this dispute over Louisiana property. ￼In Jones v. Wolf, 443 U.S. at 602, the United States Supreme Court recognized a state's "obvious and legitimate interest in the peaceful resolution of property disputes and in providing a civil forum where the ownership of church can be determined conclusively." The Court went on to note that application of the neutral-principles approach relies exclusively on objective, well-established concepts of trust and property law familiar to lawyers and judges." Jones, 443 U.S. at 603. Although the Court opined that a trust in favor of a general church could be created by the constitution of the general church being made to recite an express trust provision in favor of the denominational church, the Court noted "the civil courts will be bound to give effect to the result indicated by the parties, provided it is embodied in some legally cognizable form." Jones, 443 U.S. at 606 (emphasis added). We are not persuaded by the Presbytery's contention that the requirement of a "legally cognizable form" was met simply by the PCUSA's amending its constitution. The subject property is situated in Louisiana and applying neutral principles of law we find that any purported trust would be subject to the form requirements set forth in Louisiana's Trust Code. It is undisputed that those form requirements have not been met. The public records relating to the subject property reflect that the property is owned by Carrollton. There is no mention of the property being held in trust in the deeds themselves and it is not disputed that no trust instrument relating to the property has been filed of record in Orleans Parish. See La. Rev. Stat. Ann § 9:2092. Representing the Presbytery of Ohio Valley, attorney Judy L. Woods attempted to defend the appellate court’s decision to grant the presbytery’s trust claim on the property. Woods admitted the court does not have to use the hierarchical deference standard under which courts defer to the decisions or precedents of a denomination’s highest governing body. However, Woods said that states may use it and that Indiana has in the past. Indiana courts have also applied, however, the neutral principles standard under which courts evaluate property disputes using secular legal documents such as deeds and trust documents that have been executed according to state law without regard for denominational policies. “States may use a number of approaches to decide church property disputes,” Woods said, admitting that neutral principles had become a preferred method. “It doesn’t appear to me that the court of appeals applied those rules in this case and that’s bothersome,” he added, asking Woods if principles of trust law had been abandoned. Woods claimed that the documents and bylaws established under PCUSA polity should be reviewed in the sense of a state-sanctioned legal document. “[The appellate decision] did not get into whether these particular documents formed a trust,” she said. Woods disagreed and said the court looked at trust law as it applied to Olivet’s bylaws. “Where did Olivet ever expressly create a trust on its own property?” Dickson said. During rebuttal, Woods reiterated her earlier argument that trusts can be created under Indiana law without specific documents expressly stating such, claiming that Olivet created a trust simply by belonging to the PCUSA from 1983 to 2006. “In 1983, it said it wanted to adopt the new Book of Order, including the property trust clause. In 1994, it incorporated … and said it was subject to the entire [PCUSA] constitution,” Woods said. “If the [PCUSA] General Assembly were to amend the Book of Order and say ‘Divorces in this congregation will be governed by sharia law,’ would the members of all the member churches getting divorced have to follow those property divisions and divide their property according to that or not?” Dickson asked. Sharia is a form of religious law in Islam that can be binding as authoritative civil law in some countries. Under some forms of sharia, men may unilaterally divorce their wives simply by telling them, without regards to her wishes. Woods admitted that such a law could only be governed by ecclesiastical rules and would have no standing under secular authority. “Churches do have to adhere to civil law,” she said. “You just don’t have to abide by property law, huh?” Dickson asked. Those who have the interest in these issues, and who have an appropriate media player, will enjoy being able to view and listen to the full oral arguments by going to this link. It is always tricky to guess the outcome of a case from how the questions at argument go, but in this particular case, I will hazard a prediction that PCUSA's Book of Order will not be regarded as establishing a self-actuating trust in Indiana. And if that is the result, then the Dennis Canon will be dead in that State, as well. By way of a related resolution proposed by [the Finances for Mission Committee], the council approved borrowing of up to $60 million to refinance $46.1 million in debt that comes due at the end of this year. The $37 million renovation loan [to upgrade the headquarters at 815 Second Avenue] makes up the bulk of that amount. In addition, close to $10 million was spent on property in Austin, Texas, as a potential site for relocating the Archives of the Episcopal Church. The resolution said that the borrowing authority is also meant "to provide continuing working capital and liquidity." The resolution requires that any refinancing agreements include a mandatory repayment schedule for the $37 million at a fixed interest rate. FFM chair Del Glover told his committee earlier in the meeting that because of past budget decisions, only about $500,000 of the principal has been paid off. "To the extent that we are not paying debt, we are borrowing money to do the ministry of the church," he said. 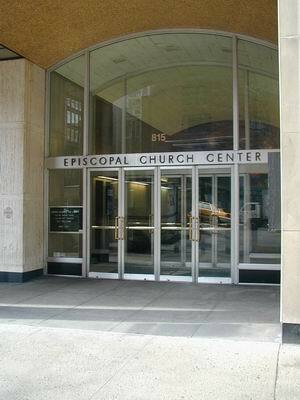 The resolution calls for mortgaging the Episcopal Church Center in Manhattan and securing the rest of the borrowing with unrestricted endowment assets. The current debt is in the form of a line of credit. Thus Executive Council gave the Treasurer of the Church the authority to borrow up to $60 million to pay off the $47 million already spent on renovations and acquiring land for the Archives, and to secure that debt with a first mortgage on the property at 815. And my post covering the meeting assumed that is just what the Treasurer would do. It turns out I was wrong. The only way this fact could be discovered, however, was to wait for the publication of the official minutes of the October 2010 meeting, which appeared only recently, and also for the posting of the annual audited financial statements of the Domestic and Foreign Missionary Society (the actual financial arm of ECUSA -- the New York corporation which holds and spends all the money). To understand what eventually happened, and why, requires a bit of background. Finances for Ministry initially discussed the borrowing authority during an Oct. 23 session that grew somewhat heated when Barnes objected to Glover having appointed a subcommittee to look into the refinancing possibilities and the borrowing philosophies behind them. Barnes said he was told that the subcommittee was to be a council of advice for him, but said "the council of advice never invited my opinion, so I don't feel it's a council of advice." He said that the subcommittee's report did not take into account the work that he and Margareth Crosnier de Bellaistre, the church's director of investment management and banking, had been doing for many months to explore refinancing options and solicit proposals from lenders. "It acts as if we've been asleep," Barnes said of the report. "The way it was approached, my staff and I absolutely felt that our intelligence or ability was always being challenged," Barnes said. "We give 10 hours a day to this church and then we have other people who say, 'but you don't know what you're doing.' That's our problem and if we have misread it, then I am sorry." Glover said that the finance office staff had misread the subcommittee's intent. He said the group, made up of former members of the Joint Audit Committee of Executive Council and the Domestic and Foreign Missionary Society and those with expertise in the area, was in fact offering advice and contacts, not implementing policy. He said the need for the subcommittee grew out of the audit committee's concern about the level of debt the church has and about the payment coming due at the end of the year. Jefferts Schori told the committee during its Oct. 23 session that the appointment of the subcommittee "points to a large issue in our system." "The job of Executive Council is to set policy, not to implement it and that's where the rub has come," she said. "It denigrates the staff, that's not helpful," she said of the creation of the subcommittee, adding that "it overreaches the authority of this committee." "I think people have gotten past the anger and the insult," she told Glover, "but let's not have it happen again." "It overreaches the authority of this [Executive Council] committee", she said. Really? The Church needs to borrow $60 million and a Committee of its Executive Council cannot inquire into the options without having its hands slapped? To read between the lines here: the Treasurer of the Church, like all of the staff at 815, works for the Presiding Bishop, not for the Executive Council. When she tells him to "find money for litigation", his job is not to ask "Where? ", but rather: "How much do you need?" And in exchange for such due obedience, she protects him from all incursions into his territory by the likes of the Executive Council -- who only imagine that they run the show when General Convention is not in session. No, this is the Presiding Bishop's show -- lock, stock, and barrel. If the Church needs money to fund her agenda, then it will jolly well have to supply it, without any interference from the Executive Council. The Church is extraordinarily wealthy, with over $140 million in unrestricted securities and investments, the gifts of innumerable donors over the centuries. And in recent years it has not been shy about borrowing against the endowment to provide it with working capital for the Presiding Bishop's ongoing litigation agenda. In early 2011, the Society completed new credit facilities to replace the previous line of credit with the Bank of New York. The new credit facilities are summarized below. At April 30, 2011, $46,340[,000] was outstanding of the $62,000[,000] total facilities available. In January 11, 2011, the Society obtained a $37 million term loan secured by DFMS’s investment in unrestricted marketable securities, from U. S. Bank, to be used primarily for working capital and other business purposes. The facility is structured as a 5 year loan with a fixed interest rate and annual repayments on a 25-year schedule. Interest is payable monthly; annual principal of $1,480[,000] is payable on each anniversary date through 2016. If not extended or renegotiated, unpaid principal will be due in 2016. At April 30, 2011, $37,000[,000] was outstanding. It is proposed to finance the project with 100 percent bank financing amortized over 30 years. The annual cost would be close to $1.9 million per year, offset by expected income from leasing space. Also on January 11, 2011, the Society obtained a one-year $5 million revolving credit facility from U.S. Bank. The facility, which is unsecured, bears interest based on the Eurodollar rate plus 75 basis points. Interest only is payable monthly. At April 30, 2011, none of the facility had been used. On April 5, 2011, the Society obtained a $20 million revolving credit facility, secured by DFMS’s investment in unrestricted marketable securities, from Bank of America Merrill Lynch, to be used primarily for working capital and other business purposes. The facility bears interest based on the Eurodollar rate plus 1.0%. Interest is payable monthly. The revolving credit may be drawn and repaid at any time through April 2016. If not extended or renegotiated, unpaid principal will be due in 2016. At April 30, 2011, $9,340[,000] was outstanding. The $60 million requested amount represents 43% of the $140 million in unrestricted endowment assets available to the Society at 9/30/10. That 43% figure (the result of dividing 60 by 140) is rather misleading. For as disclosed in the financial statements, the loan terms require that 133% of the loan amount be maintained as collateral if it consists of equities (stock) or bonds, and 111% of the loan amount if the collateral is cash or cash equivalents (CD's etc.). And as we also just saw, the Treasurer arranged for $62 million of credit facilities, not just $60 million -- although of that total, $5 million is unsecured. So, if bonds or stocks are the identified collateral for the remaining $57 million, the Church would have to set aside $76 million of its unrestricted endowment as collateral. That represents approximately 54% of the total -- not 43%, as reported to the Council. One has to question the soundness, as a simple business proposition, of borrowing one's working capital for an enterprise whose budget is shrinking. The Church is a non-profit entity; its "revenues" are mainly donations -- although Government payments to it for running Episcopal Migration Ministries have increased significantly in recent years ($15.8 million in 2010, up from $11.4 million in 2009). Ordinarily, working capital is used to expand production facilities, in order to be able to meet increased demand -- and the idea is that any amounts borrowed will be repaid out of increased revenues from the ability to make and sell more products. No such parameters apply to the Church's case. Indeed, looked at from the standpoint of voluntary contributions, the Church's revenues are declining as the Average Sunday Attendance and plate and pledge figures decline in tandem. Contributions from Dioceses went from $32 million in 2009 to $27 million in 2010. Moreover, the auditors' description of the credit facilities does not include any suggestion of how the Church intends to repay them. The interim amounts being paid on principal are insignificant until the full amounts fall due in 2016. At that time the loans will once again have to be renegotiated or extended, and the Church's level of borrowing will continue as before. In short, mortgaging its headquarters will be the least of ECUSA's worries in the short term. But without a determined plan to retire its total debt in the next ten years, ECUSA will either have to sell the building, or else sell off around half of its unrestricted endowment. Borrowing money to finance litigation and other non-church-like ventures, and then asking for voluntary contributions to repay the debt, is not a Christian way to manage a church's affairs. In short: where ECUSA is concerned, the temporal bids to overwhelm the spiritual. If you watch video of that performance, you can hear Bono, over the music and the cheering, speaking into his microphone: “Lord, open my lips that my mouth may sing forth your praise.” The same words spoken at the beginning of the Liturgy of the Hours in the Catholic Church. On the banner were projected the names of all those who had died on 9/11, less than five months before. Have it your way, Mr. Krugman. Let's let Deacon Greg have the last word, shall we? We forgive you your inexcusable hatred and bile, Mr. Krugman. May God forgive you, as well.